From 2003 to 2006 they followed a once-a-day (OAD) milking programme to reduce the labour involved. “The OAD system is a great system and it is worth looking at,” said Peter, with growing interest in the programme throughout the country. It was 2004 when they began thinking about converting to organic before taking the leap in 2006. “Once you are in, you have to play by the rules; to get there, you have to make sure you are ready for them. We made a lot of silage, we made sure our Ps and Ks were up to date, our lime was good. So we basically got ourselves ready over two years to go into organic,” he said. 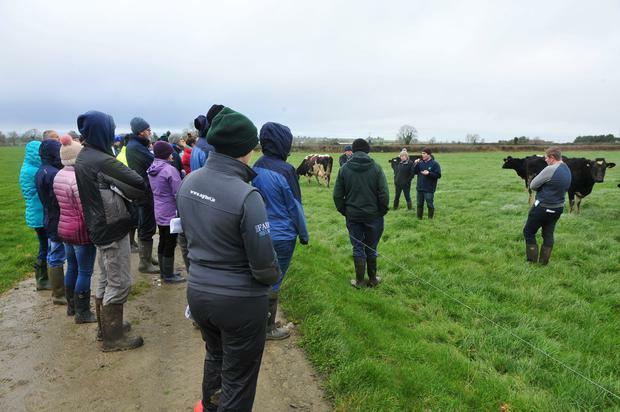 Peter Young talks to the group during Teagasc Organic Dairy Farm Walk. They moved from 50 to 100 cows and went into winter milk as it was a requirement for their supply to Glenisk. “We calved 20 or 25 cows, it was a token gesture of winter milk,” he said, adding that they applied for grants for a milking parlour and roadways. “The market is the biggest challenge in organics, while management is also a challenge,” he said. “You don’t have the fertiliser bag, but you have a lower stocking rate, a lower output. You won’t grow grass like a conventional farmer, you’ll grow about 8-9t. We have access to dairy sludge. “With dairying in particular, you are selling a lot of Ps and Ks out the farm gate,” he added. After they exited winter milk in 2015, around 45pc of their pool went organic and the rest conventional. Last year, around 78pc went into organics. “You do need a 20pc premium on organic milk versus conventional milk over time to justify it,” he said, with the average organic price working out at 42c/l last year. “Organics, while it is growing, it is still a very small niche. There was potential,” he emphasised, looking at the German and French market where a lot of the cheese is sold. “Too many times I’ve seen farmers put them in and in two or three years’ time they want to add more units or expand it,” he said, adding that the unit has capacity to go to 35 units. 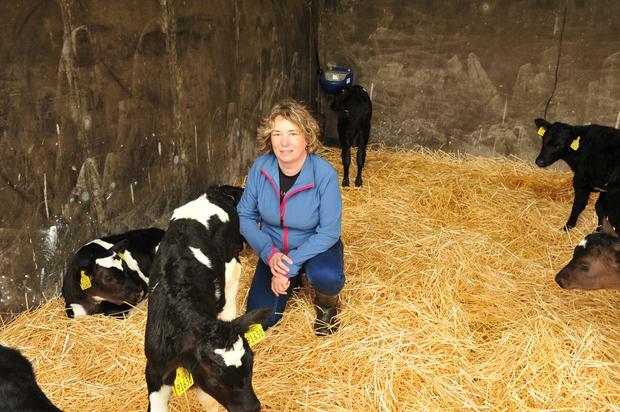 “It is about reducing labour and being smart, and that is why the investment is there in the milking parlour,” he said, with one person working full-time on the farm, and another part-time. “There is a big difference in the market opportunities depending on the crop or the animals you have. There are five organic dairy co-ops who are more than willing to talk to farmers. “We believe it is a very profitable way of farming,” he said. However, there are challenges for those considering organic dairying. “Early grass is a challenge for nine years out of 10 in organics, this year being the exception. 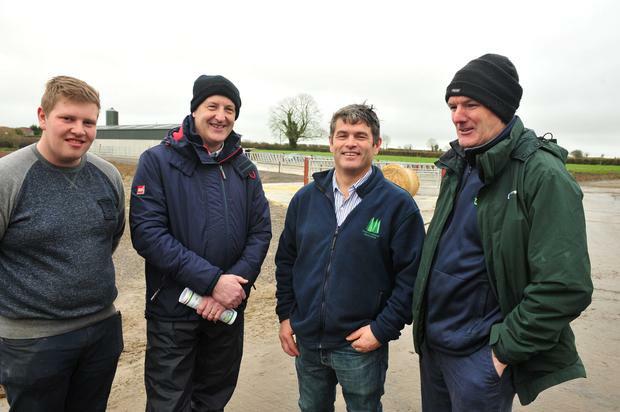 It is about making good use of slurry and white and red clover, which require high levels of management,” he said. He pointed out there were a number of companies buying organic including Glenisk, Aurivo, Arrabawn, The Little Milk Company and The Village Dairy. “Stocking rate might be higher on a conventional farm so you need to get that higher price,” he said. “It is possible in the future that there may be opportunities to supply milk into the spring market and that could come from organic baby infant formula,” he said. “If farmers can be offered a viable three or five-year contract, that is the main ingredient required for people to supply more spring milk,” he said. Teagasc financial advisor James McDonnell advised farmers to look at where they want to be in 10 years’ time before turning to organics. He pointed out many conventional dairy farmers have expanded beyond what they are truly capable of coping with.